Basement remodeling is growing very quickly in popularity. With that said, DBS is proud to provide an easy, efficient and beautiful basement finishing process, with financing plans to suit your needs. DBS would like to show you the steps of our services so you can see the difference in our remodeling process from our competitors. We carry patented wall, floor and ceiling finishing products designed to create a dry, timeless space in your basement. 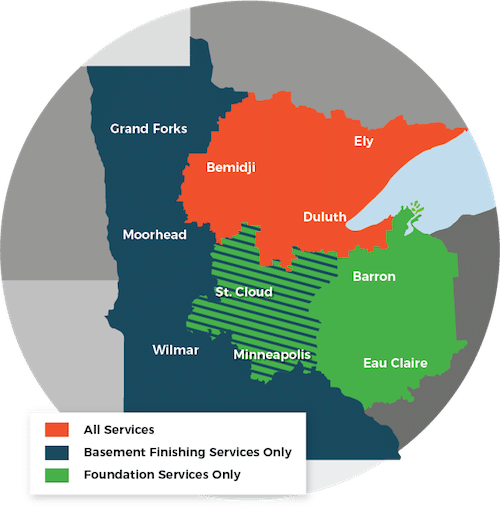 Our basement finishing services are available throughout Duluth, Superior, Minneapolis & surrounding areas of Minnesota and Wisconsin. Call us today if you would like to receive a free estimate or more information about repayment options on our new, advanced way of finishing basements. The first step of the process starts with a free estimate. One of our representatives is able to discuss basement finishing options, as well as financing options with you, which will allow you to take control of your project. After that, we waterproof your entire basement to be sure there is no leftover moisture or water damage from not being used over the years. After waterproofing, we are able to install our patented and warrantied TBF walls, ceilings and flooring options that will fight the harmful effects of moisture, creating a dry, beautiful space in your basement. Take a look at the basement remodeling products that we offer to see all the ways we can improve your home's space. Ready to get started? Contact us to schedule a consultation and free estimate. We proudly serve Cloquet, Two Harbors, Hermantown, St. Paul, Esko, Virginia, Ashland, Hibbing, Proctor, Eveleth, Grand Rapids, Hayward, Eau Claire, Bemidji and nearby.